Vacation rental condominium. Sleeps 5, 1 bedroom, 2 bathrooms. No pets allowed. 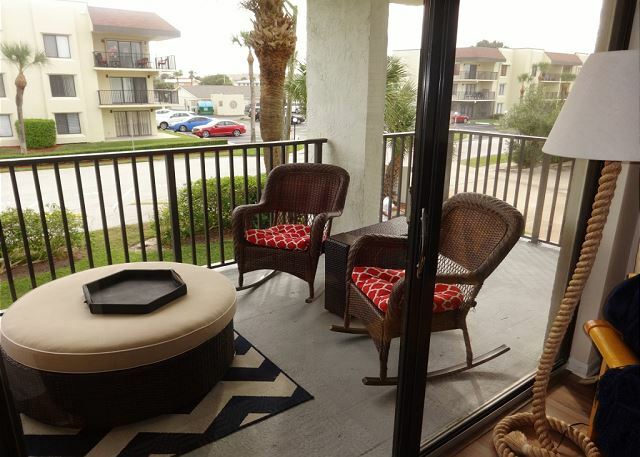 This Renovated Nautical Vacation Nook located on the 2nd floor is an end unit one bedroom/two bathroom condo decorated in shades of grays and blues. Come stay with us and see the great ocean and pool views from the oversized wraparound balcony that has plenty of sun exposure and a great breeze. 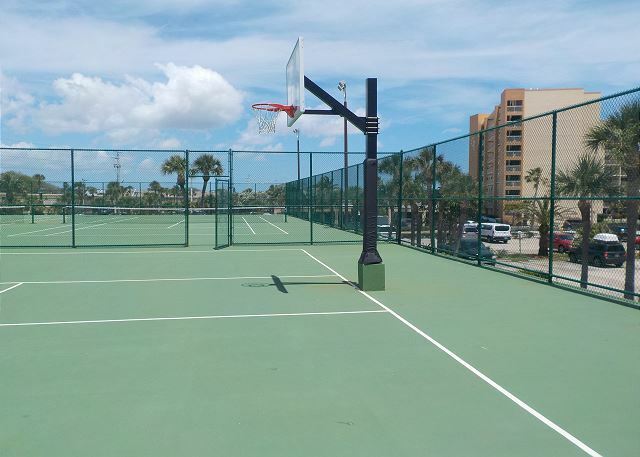 Cape Winds OCEAN FRONT RESORT has a pool, hot tub and tennis/basketball courts. Great location! No complaints whatsoever. Will surely be back to this spot. More than what we expected and very easy to get to beach, pool, and parking. 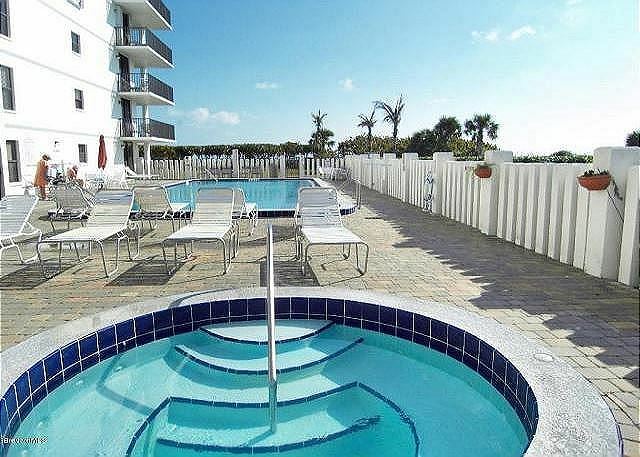 If we were to buy a condo on cape canaveral... this would be it! 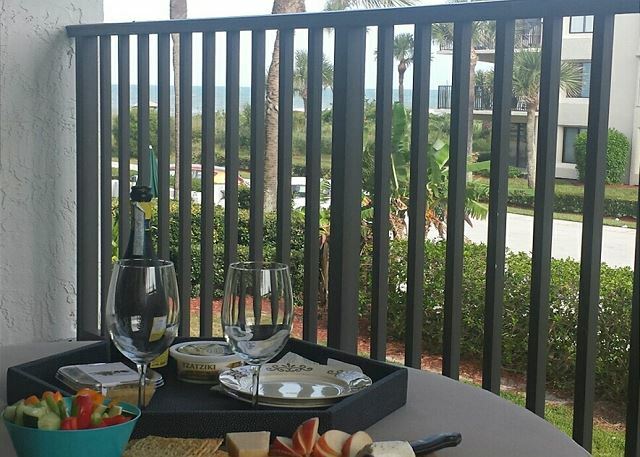 We had a great time at this cute condo, the balcony was big and the furniture on the balcony was perfect! The only problem was the guest below us kept lighting up cigarette after cigarette and it was hard to relax when you have smoke constantly on your balcony. This is at no fault to the owners of the condo. Also it seems the community is a retirement group. The pool had the seniors in it the entire week and was packed, one gentleman wouldn’t get out of the pool the entire day, which begs to question bathroom breaks. We avoided going into the pool because each time we would attend the pool area, they would give us the stare of death, so let’s just say we avoided the pool area. This is entirely the guests that made us feel this way, this is in no way to reflect the cute, updated condo we rented. If it wasn’t for the guests I would have rated this condo a 5 out of 5. A vacation with no surprises, this rental description is completely accurate, We had to leave a message for maintenance and they responded and repaired the issue within 2 hours, he even repaired a second item while he was there. The unit does have some minor bumps and bruises of a rental but we would possibly rent this unit again. 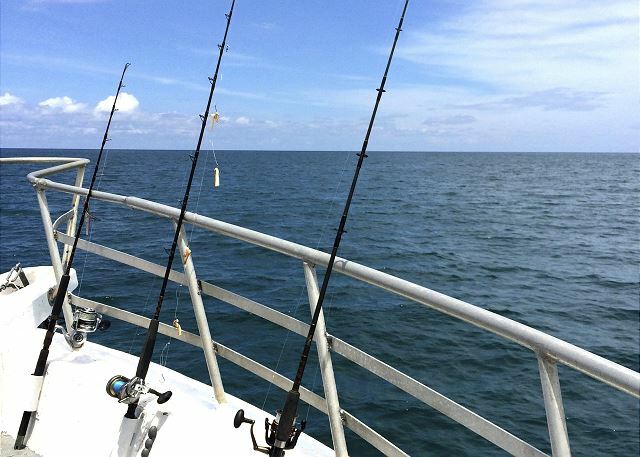 This was our fifth year in Cape Canaveral and the Cape Winds property is the best location we've found. This place was far better than expected, everything was clean and updated, the kitchen was completely upgraded, I believe the photos are older so count on an amazing experience booking this place. Very quiet, and perfect to decompress! Thanks for the great review and thanks for being great guests. This condo was easy to book and was very clean and comfortable. 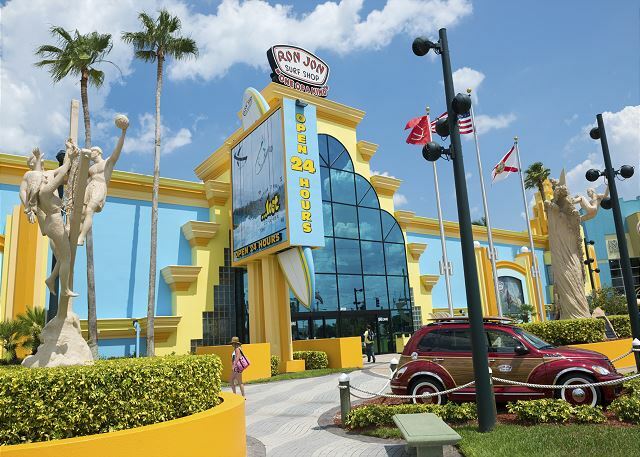 An easy walk to the main pier and a couple of restaurants and many within a short drive. 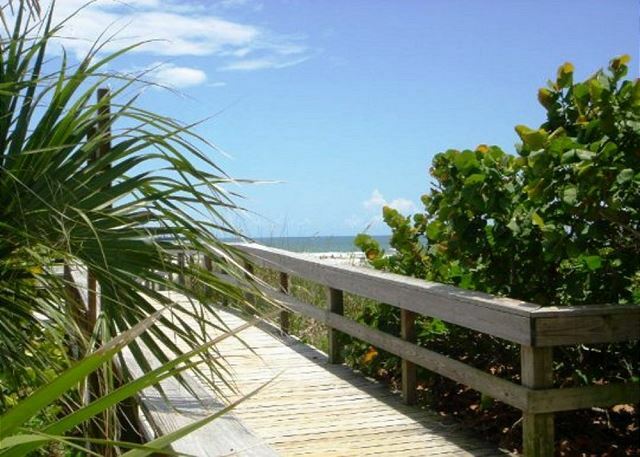 There is a quiet road to walk,or drive into the busier area without taking the A1A. Grounds were well kept and the pool was heated. Everything and more that my sister and I could have hoped for! Relaxing and comfortable with wonderful views of palm trees, the pool and the ocean from the balcony. Unit was well equipped with everything to make your stay feel right at home. Will definitely return, can't wait!! This condo is absolutely lovely and well stocked with everything you could need while spending a week enjoying the beautiful beach. The bed and the pullout bed were both fabulously comfortable and the bedding and blankets were abundant. 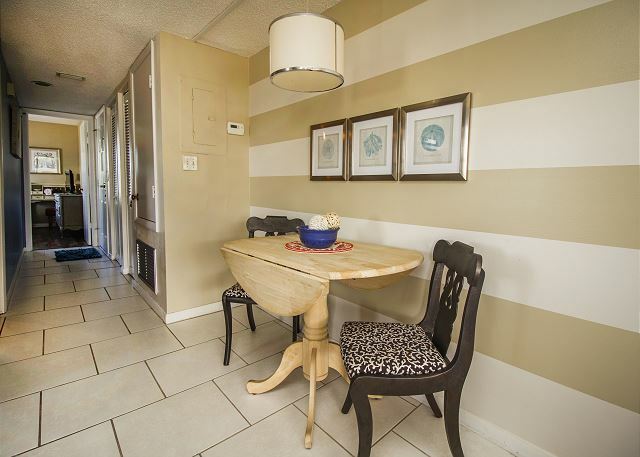 The whole condo has been beautifully decorated and the flooring especially is gorgeous! The owners are thoughtful enough to include beach toys, boogie boards, beach chairs, towels, and even floats for the pool. I would definitely recommend this lovely home to others and hope to find myself back there again in the future. My boyfriend and I drove from Maryland to stay here for a week. We arrived early and I contacted the property manager and she let me know as soon as the condo was ready and let us check in a few hours early! The condo was just as nice as in the pics! The balcony is amazing as well as the little sofa that's on it. 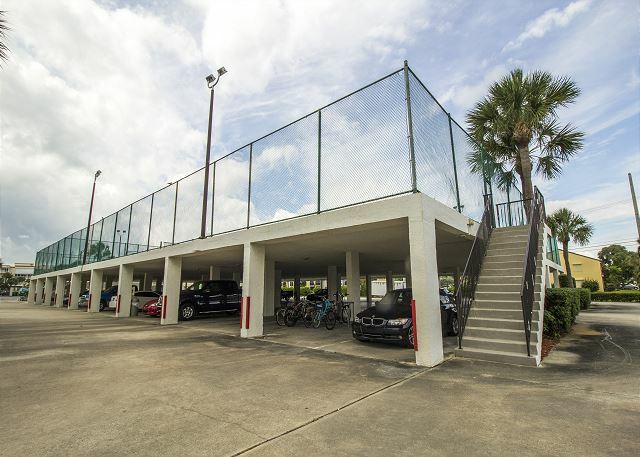 The condo was in a great location and has a great pool and area for basket ball or tennis! We loved our stay here and would love to book here again! Can't wait to have you book again with us. 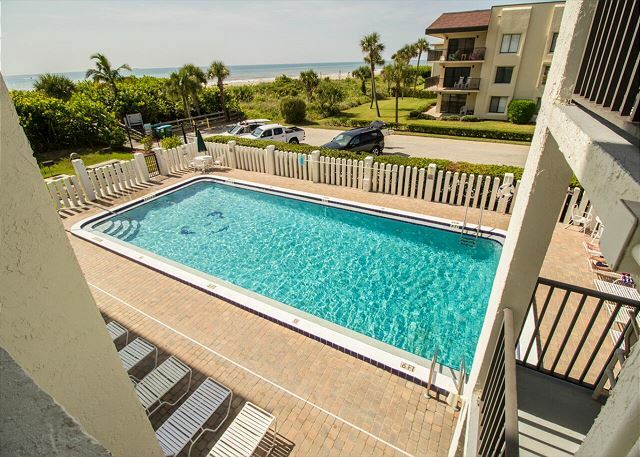 Make sure you book directly with the Cocoa Beach Best reservation department and we will give you a nice returning guest discount and we work out non-interest payment plans. Thank you for being amazing guest. We had a great stay at this condo. It came as advertised and the view of the ocean was nice even though the condo is toward the back of the building. The pool was nice and it all worked out perfectly for our beach getaway. We enjoyed having you as a guest. Thank you for staying with us again. We Value you as a guest. Hello our stay was great, the place was as described, clean, beachfront Fantastic everything . Our only complaint was the time to get into the place was at 5PM. It would have been better if it was couple hours earlier like 3PM. Other than that, we had a great time and highly recommend. Thank You for your review. We can accommodate an earlier check in time just request it at the time of your booking. If we are able to honor the early check in time we will. We want you to enjoy your vacation. GREAT VACATION RENTAL !!! A few yards from the beach !!! On vacation from Canada ! Me my Husband and our three year old daughter. We booked about three months in advance. Communication was smooth, payments processed at the right time, and we simply got there opened the door with the code and that was it. Condo was as described. Was really clean, smelled good, and everything was available as described. We had all we could think of in terms of kitchenware, we had to buy nothing we didn't expect to. Also included were the beach furniture, towels, toys and a little cart to bring everything. The umbrella was broken, so we had to get one from the beach warehouse, but hey they were 10 bucks ! We also had a little issue with the oven as it was in ''locked'' mode. We tried to figure it out, but couldn't so Breanne sent Mike to fix it, he was there in the next hour, and had our issue resolved. There was plenty of parking, and the beautiful beach was a few yards away. You can actually put on flip flops leave with a towel, bathe in the ocean and walk back to the condo. Paradise. The beach is 30 seconds away. The pool area was clean and perfect, and the view from Unit 215 was great even though it's on the side. I strongly recommend Cape Winds for a rental, and Cocoa Beach Best for the great service. Great condo. 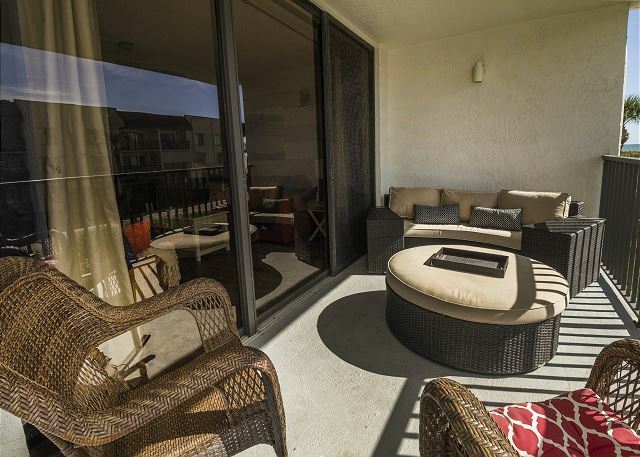 Nice corner unit with large patio. Love the large patio also. Please come stay with us again in the future. The rental experience was great with only one issue, the WIfi. For whatever reason the wifi would not connect well with computers, it was great for devices but would not connect well with my computer. This is the most perfect hideaway. The condo was fantastic everything you could possibly need. Clean and tidy and very well thought out. We especially liked the balcony after a hard day on the beach to chill out on there with a glass of wine was fantastic. The owners were a pleasure to deal with from start to finish. One of the best condos we have stayed in. The pictures do not do it justice. We will be back in October . Perfect unit for a couple. Small complex so parking is easy and never much of a walk. Great and relaxing vacation spot! We stayed at this condo in Decenber over New Years and what a relaxing vacation! 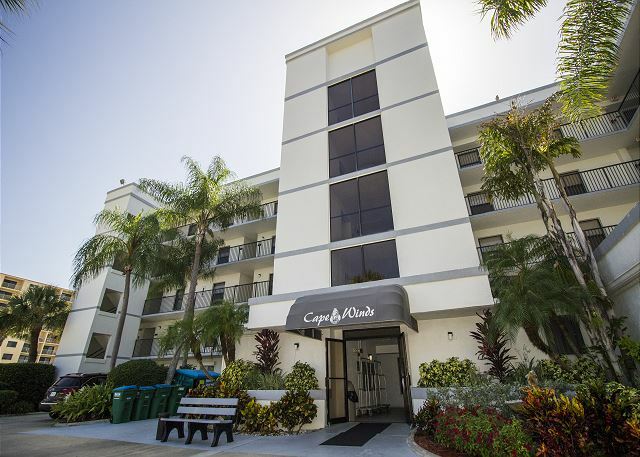 The condo was in a very convenient location and all amenities were great! 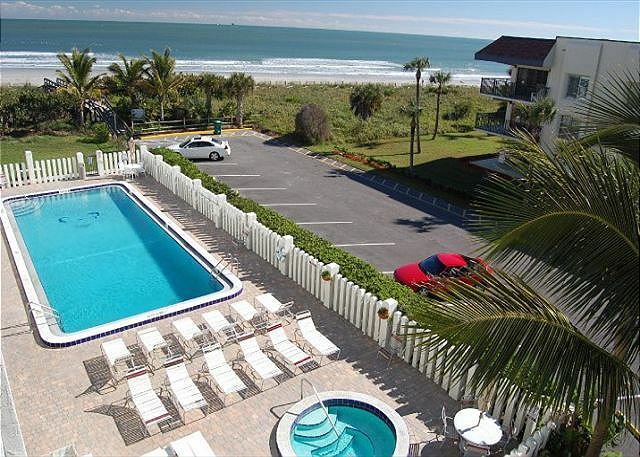 I would highly recommend to anyone looking to travel to the cocoa beach/cape canaveral area! We had an excellent time at Cape Winds. The complex was a few blocks off the A1A, so it was very peaceful location. The building and grounds were in excellent condition. Unit 215 was clean and nicely decorated. The denim couch was so cool. We loved the large balcony and spent many an hour there gazing at the ocean. The condo was well equipped for the most part. We would recommend that they provide better beach chairs and a small cooler for trips out to the sand. That would have made our stay perfect. All in all though a very pleasant stay. Thanks so much! This was my first time visiting Florida and also renting a condo, technically second as we rented a unit on the Clearwater gulf side during this trip as well. We rented this unit for 6 days as they allowed an exception from the min of 1 week rental. From the moment I emailed about availability along with general questions, Marla who was the property manager did an amazing job with responding to all my questions and concerns in a very prompt manner. Everything was very clear and I didn't feel too intimidated with the process despite it being my first time renting. The condo itself was clean, had a basic kitchen but with lots of dishes and pans if you wanted to cook a full meal or were staying for a long period. The unit looked exactly as is in photos and described. The bed was quite comfortable and plenty of towels if needed. It was very close to the beach, and the pool was great as well. The only slight negative thing to mention - although it was fixed very promptly when we emailed, was concerning the kitchen sink which wasn't working. It was fixed the next afternoon. When we also arrived there was also a sour milk smell coming from the sink but that was easily taken care of with water and soap. 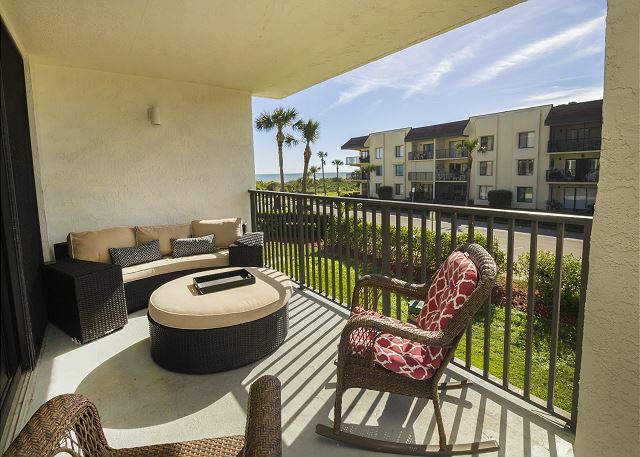 We found this condo was also a decent location as we also did a lot of day trips to Orlando for Universal Studios/Disney, St. Augustine, Daytona Beach, & Kennedy Space Center. 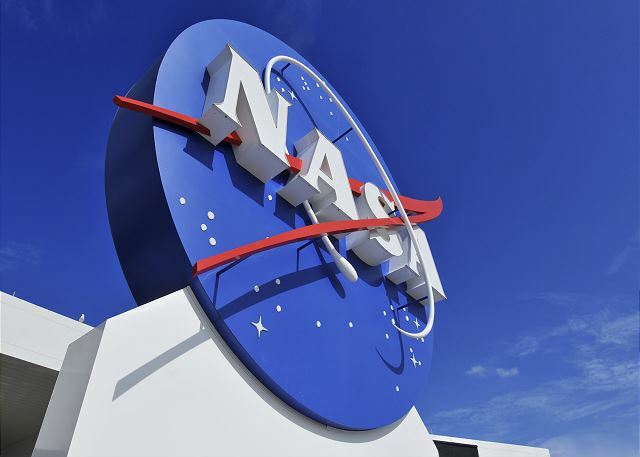 Lots to see and do in the area. The location also felt safe overall. Would highly recommend to a friend and would stay at again. The condo itself was lovely. However we were a little disappointed and found it strange that we had to wash the towels from the unit before we left. This became more difficult when we discovered that the laundry downstairs closed at 10 p.m. I would still recommend anyone to stay there, but I would consider changing this policy. My condo was very clean and nicely decorated. It has everything that one would need for a great stay. I would highly recommend this place. The rental agent was very professional and everything she described was exactly what I found to be true. She handled the rental transaction efficiently. I would stay here again! Enjoyed the condo after the tv's were ffixed to operate. The managaer came over promptly and fixed my problem as soon a feasible. Other than that, pleasant stay. The folks at Coca Best Best, Inc are the best. The place was like new and the staff was very helpful with the few issues I did have regarding the microwave. laundry room in the unit. Location is great. We appreciate the feedback. This condo now has a new owner and is being updated with all new flooring and furniture to improve the overall condition of the property. We have taken down the blinds over the slider and have installed curtains. We have also adjusted the length of the curtains in the master bedroom. The laundry facility on site is located one floor below. One bedroom units in this complex do not have laundry hook ups inside the condo. We hope to have you as a guest again. Enjoyed the condo, however the remote in the bedroom was not there when we checked in, other than that, the stay was wonderful. It was exactly as expected. Right on the beach, easy walk, clean, perfect for the family. Very clean and comfortable. Loved the close location to the beach. Best pool ever! Would go back. We were very pleased with the location and the rate.The sliding door was hard to open and close. 7400 ridgewood ave #215 from Moving Pictures of Brevard on Vimeo.